You are going to shop! Get Paid to do it! It doesn't make CENTS not to! Get paid to do shopping you were going to do anyway! It doesn't make CENTS not to! ﻿I absolutely love love love ibotta! Great items are added everyday and the bonuses are absolutely out of this world!!! Sign up using the "SIGN UP NOW" button below and you will get $10.00 for the redeeming your first rebate within 2 weeks of signing up, you get $5.00 for each friend you refer when they redeem their first rebate and there are a ton of other bonuses for you to earn! When you reach $20-$25 you can withdraw your cash via PayPal or by getting a gift card to various popular retailers! Ebates makes getting paid to shop online so easy!!!! After you sign up you simply go to the Ebates site before you start shopping scroll to find the store you want click it and then shop and pay like normal! Ebates takes care of the rest, and a rebate appears in your Ebates account! Not only that Ebates offers you great bonuses for referrals and a bonus for making your first purchase using Ebates! You can have a check mailed to you or transfer your funds to PayPal! Use the "SIGN UP NOW" button below now! SavingStar is an awesome way to save! I get excited when the new deals are loaded into the app because I know it will be great values and it will be items I actually use! I love using the app at Giant food store. I check my shopping list and then I check to see what products are in the app I add them to my SavingStar list. I put my items in the cart and when I am in the checkout lane I scan my bonus card and I am done! I just wait for the alert that funds are now in my SavingStar account!Use the "SIGN UP NOW" button below now! Mobisave offers cash rebates on your everyday items! Anything from apples to allergy medicine! When you successfully redeem a rebate the funds are automatically sent to your linked PayPal account! Talk about instant gratification!!! Use the "SIGN UP NOW" button below now and start saving! 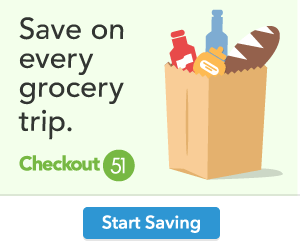 A wonderful yet simple to use app to get cash back for everyday items. Use the "SIGN UP NOW" button below now and start saving! shopkick is a very unique app in that you can get free gift cards without spending any money! I should have your attention now! You earn kicks just for walking in the store! You can earn even more kicks by simply scanning an item and then putting it back on the shelf! Now to answer the question; What are kicks? Kicks are like points that add up and when you get to a certain level you choose a free gift card to the retailer of your choice. In only 2 weeks I've earned a $5 Target Gift Card! Not bad if you ask me! Use the "SIGN UP NOW" button below now and get your kicks!